Kingpin North Strathfield is a revolutionary entertainment destination based on an international bowling alley design model. Ignite has developed a playful, highly engaging and authentic space which strongly appeals to patrons, and celebrates the building’s unique heritage. 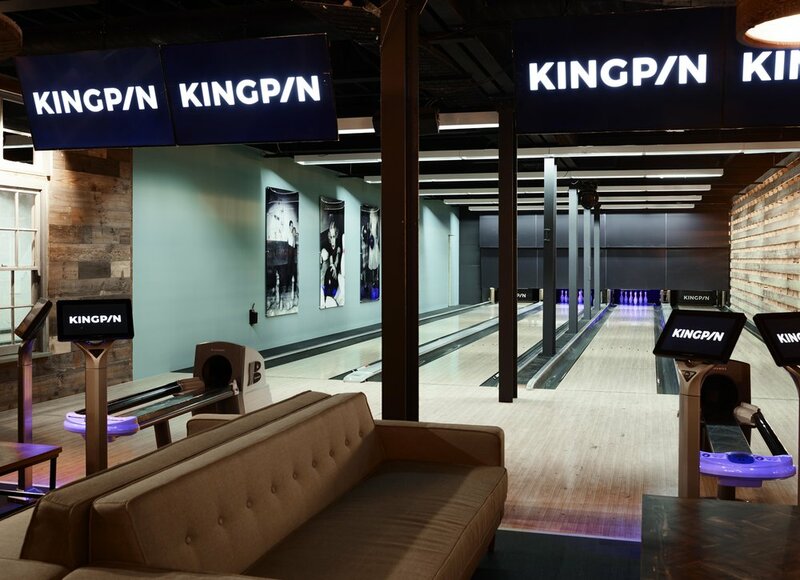 The industrial Arnott’s factory has been transformed into a hot new destination in Sydney – Kingpin North Strathfield. Along with serving excellent food, it provides a range of entertainment possibilities including a restaurant, bowling alley, gaming arcade, karaoke sports bar and laser tag venue. The design upgrade by Ignite has given a fresh new look to the precinct and changed the dynamic of the tenancy. This has resulted in a younger demographic making it their destination of choice. AMF Bowling Centres in Australia were grappling with adding value to an industry which was struggling to make a profit. The traditional bowling alley format was aimed at league players, who would arrive, play a game and leave. This model was also losing its customer base in the United States, leading bowling centres there to try an innovative approach to attract a new crowd. The reinvention involved splitting the alley format into three separate, yet complementary, offerings – bowling, dining, and other entertainment. Ignite was engaged to redesign the United States model to fit with Australian materials, standards, aesthetic, and budget. After a design process of nine months, Ignite has created an entertainment facility which kept the look and feel of the client’s original design, improved its cost-effectiveness, and ensured it was more relatable to the Australian market. 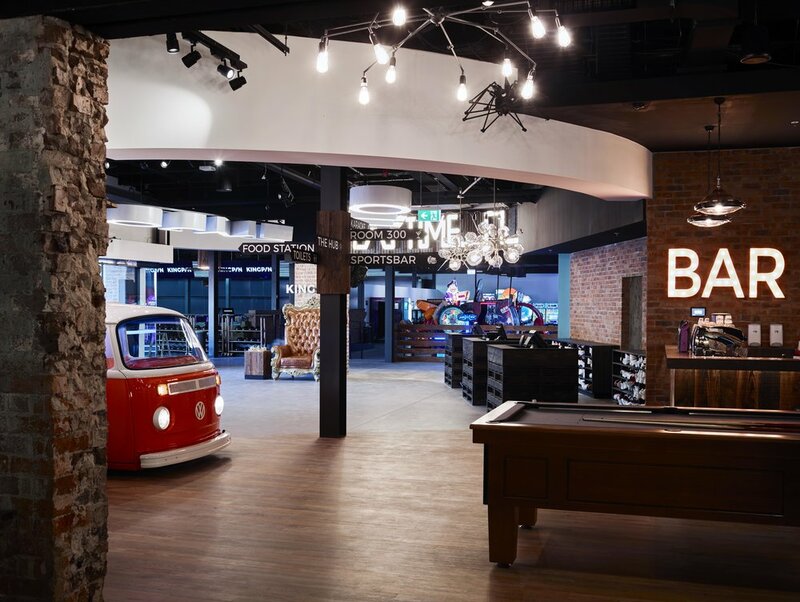 The design for Kingpin North Strathfield saw the tenancy divided into separate areas – bowling, an entry foyer area, servery counters, a sports bar and VIP rooms. The tenancy originally had 30 bowling lanes, but ten were removed to accommodate the new design with a larger arcade offer and dining areas. The design team worked around the existing location of the remaining 20 lanes, and the location of the kitchen, to develop the new layout. 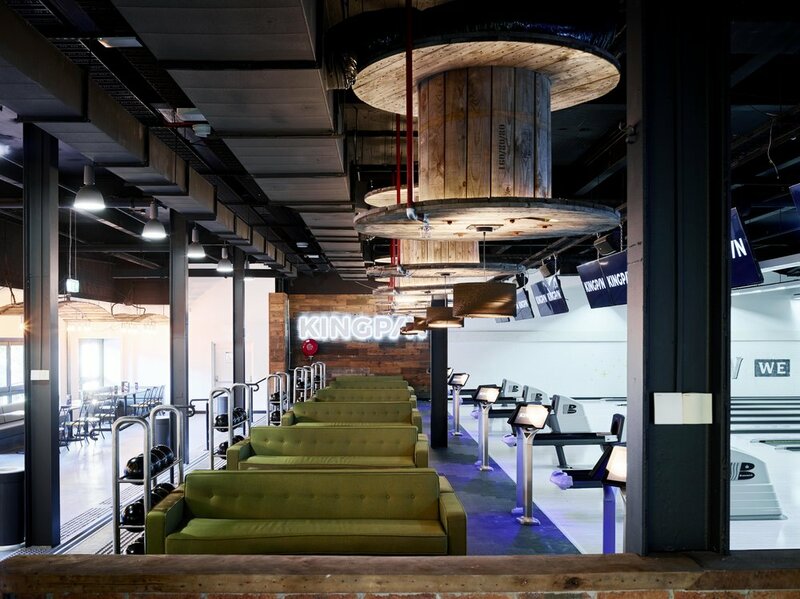 The bold and dynamic interior fit out sees the creation of The Hub as the central bowling and dining space. This features distressed leather with gold trim furnishings, metal and rustic wood finishes and designer lighting. A chef curated bistro style menu is served from a Kombi van servery. The original design called for a food truck servery, however Ignite’s adaption provided a number of benefits – a Kombi was an ideal size for the space, it was more cost-effective to purchase than a traditional food truck, and it had a sense of fun and nostalgia which would appeal to the clientele. Room 300 is a 60-capacity secluded function space, tucked in behind the Sports Bar, offering three private bowling lanes, in-room bar service and an adjoining private karaoke room. The karaoke room and Room 300 can be used together or separately. A magnificent set of oversize barn doors act as an easy to use, and soundproof, room divider between the two spaces. The entire venue needed to close for the refit, so this was planned during the business’ slowest trading period – the eight week school summer term. This meant all construction, upgrades and refit needed to occur in that tight time period. The key to achieving this was a close relationship with contractors, the Council and the client.